The Basque Region in Northern Spain is home to Euskara, a minority language dwarfed by the dominant language Castellano, or Spanish. Euskara speakers live in three politically and geographically distinct regions: the Basque Autonomous Community and Autonomous Community of Navarre in Spain and the Département de Pyrénees Atlantiques in France (Amorrortu 1). Although there is a small Euskara-speaking population in France, my paper will focus largely on the Basque population of Spain, as language planning efforts originate primarily from this region. Of the 3 million people inhabiting these regions, 700,000 of them speak Euskara, which has progressed through various stages of use and disuse (Amorrortu 1). Economic, political, and social conditions in the 19th nd 20th enturies are largely responsible for the complex status of Euskara in the present century. It is important to note that Basque speakers, unlike speakers of other minority languages, are unassociated with status and power—they are simply ethnically distinct. While it remains a minority language, much of the Basque population considers Basque language an important component of their identity , values bilingualism and actively promotes the language through education and communal consciousness-raising efforts. Economic, political, and social conditions provided the impetus for the Basque population to consider language sustenance and language revival necessary. Basque nationalism emerged in the 1890s, stimulated by developing socioeconomic dynamics. Basque society experienced industrial revolutions from 1842-1868 and from1960-1975, accompanied by an economic transformation from small-scale agriculture and commerce to mining, heavy industry, shipbuilding, and banking (Shabad and Ramo 415). Each industrial boom caused rapid upheaval of the entire population, characterized by both urbanization and an increased population. The sudden establishment of an urban, middle-class population provided the foundation for socioeconomic solidarity, a factor which would later prove pivotal in the movement to protect Basque language. The impact of this newfound solidarity was twofold: first, it “creat[ed] modern infrastructures for ethnic mobilization” and second, it threatened “idealized, traditional Basque culture,” allowing Basque constituents to move toward a more pragmatic bilingual policy (Shabad and Ramo 417). The homogenization of this population is reflected in the similar priorities of today’s language activists, politicians, Navarre government and overall Basque population. Tumultuous political changes were arguably even more responsible than socioeconomic conditions for causing individuals to declare language planning a necessary step toward the protection of Euskara. Though unified in 1512, Spain’s provinces remained politically isolated from each other, allowing for the formation of a minority culture and language to form in the Basque Country. As a result, threats to Basque national identity were perceived early on, resulting in the establishment of the Partido Nationalista Vasco (PNV) in 1892. This political party (and others that followed it) represented a rigid ideology, consisting of “the Basque language, racial distinctiveness, ultra-Catholicism, and… [the] rejection of everything Spanish” (Shabad and Ramo 418). Here, a dichotomy is established between Basque Country and the rest of Spain: this “us vs. them” mentality would help to provide the necessary cohesion for a linguistic movement. Perhaps even more importantly, this mentality became deeply entrenched during the Francoist regime. Franco’s goal was to create one “personality” for the entire nation of Spain, depriving resentful Basque citizens of the autonomy they enjoyed before the dictator took power in 1939. Coupled with a steady influx of immigrants in the 1940s and 1950s, the use of Euskara was stifled and then completely restricted from the public sphere (Amorrortu 3). During the Francoist regime, around 8,500 Basque citizens were imprisoned, arrested, and/or tortured as a way to control and manipulate the population (Shabad and Ramo 419). As a result, many segments of Basque society considered it necessary to erect a defense to support and preserve their national identity. Basque language quickly emerged as the keystone of this movement, and to this day there is a general sentiment that one must speak Basque to be Basque (Echeverria 356). However, because Franco’s forces were so overpowering and adamant about restricting language usage to Castellano, Spain’s primary language, a strong public reaction was not evident or even possible until Franco’s death in 1975. Estibaliz Ammorrortu explains the lasting impact of the regime, stating that “…Linguistic and cultural repression during the dictatorship period and greater consciousness of the loss of Basque distinctiveness made Basques perceive language shift as traumatic and produced a popular reaction to recover the Basque language…” (Amorrortu 4). The reactionary movement to restore Basque culture to its former status as enjoyed before the long period of Francoist oppression focused on the symbolic importance of Euskara as a manifestation of the Basque community. In sum, the formation of a strong, large middle-class, perceived linguistic and cultural repression by the rest of Spain, and physical violence and linguistic oppression against Basque citizens by the Francoist regime set the stage for a national language movement by some segments of society (such as activists and ETA terrorist members) and calculated language planning efforts by others (like educators and much of the general population). Defenders and promoters of the Basque language come in various forms and have an accompanying variety of motivational factors. Because Basque government wants to restore and strengthen the language to avoid “cultural extinction,” language planning and the promotion of Euskara are ingrained in the government’s political agenda. Politicians will traditionally begin speeches with a few words of Euskara to demonstrate support for the language, even if they cannot claim fluency, reflecting the importance of preservation to Basque constituents (Amorrortu 2). Certain groups use even stronger rhetoric. For example, ETA (Euskadi ta Askatasuna – which translates to “Basqueland and Freedom”), a radical nationalist organization that has carried out terrorist actions against other provinces of Spain has said that, “the day that Basque ceases to be a spoken language, the Basque nation will have died, and in a few years, the descendants of today’s Basques will simply be Spanish or French” (Urla 379). For ETA, cultural and especially linguistic preservation is both literally and symbolically a matter of language life or death. It is also a matter of physical human death, as ETA has sought to advance its ideology through violent attacks on police, politicians, and civilians, even since the democratization of the Basque Country (Shabad and Ramo 445). For politicians, members of nationalist groups, activists (particularly those belonging to younger generations) and citizens, the strong ties they feel to their Basque identity are inextricably intertwined with the language Euskara. This alone has proven to be a powerful motivating factor in the promotion of the Basque language. For example, a more academic impetus or intellectual justification presented by activists draws upon the Sapir-Whorf hypothesis. Some activists utilize the argument that one’s mother tongue distinctly impacts his or her worldview. The logical extent of this argument is that losing the Basque language means losing a specialized manner of thinking and perceiving, which could result in individual personality loss and ultimately the disintegration of Basque social identity and cohesion (Urla 395-86). Interestingly, some activists also see it as their duty to “reign in…zealous nationalists” and to control decision making and language reform, lest it become irrationally and erratically patriotic (Urla 383). The proper way to do this, in their opinion, is through calculated language planning strategies, rather than through impulsive movements or violent action. Significantly, I chose not to include the method of legislation as a primary tool of language planning and revival because when Euskara attained co-official status after Franco’s death, citizens deemed this precaution insufficient, demanding “deliberate regulation and promotion of minority language use through…educational programs and media campaigns” (Urla 379). Nationalist organizations such as ETA similarly do not consider formal recognition in the Spanish Constitution of 1978 to be sufficient protection for Euskara, or they would not carry out systematic, planned violence against mainstream regions of Castellano speakers who claim Spanish (as opposed to Basque) identity. The preceding groups and individuals which constitute and represent Basque society have utilized and continue to pursue the following techniques to restore, revive, and protect Euskara from the possibility of endangerment and/or death. In the Basque Autonomous Country, the primary language planning method in terms of sustainability, practicality, and success rate is education. Under Franco, secret schools for children called ikastolas were established to begin the revival of Euskara (Echeverria 353). Simultaneously, communal and family funding allowed adults to learn Basque as their second language in gau-eskolas, popular night schools. This desire of native families to connect with their roots and immigrants who wished to assimilate themselves by learning Basque as a second language reflected the social conscience of a growing grassroots movement and the close link between Basque identity and Euskara (Amorrortu 4). In a way, these men and women were demonstrating to themselves and their families that although Franco’s violent regime deprived them of the right to use Euskara and the ability to be Basque in the public sphere, they could find consolation by maintaining their national and ethnic identity in the private domain. Today, government policy has prioritized the integration of Basque into elementary school education, with the hope that instructing younger generations in Basque as their first or second language will preserve it for years to come. The Act of Normalization of the Basque Language, passed in 1982, gives parents a choice of four linguistic models through which they may educate their children. Model A uses Spanish as the primary language of instruction, and treats Basque as a secondary subject to which only a few hours are devoted each week. Model B uses Basque and Spanish equally as the languages of classroom instruction. Model D uses Basque as a primary language, and treats Spanish as a subject to which a few hours are devoted each week. Very few children (only 1 percent of students) study under model X, where everything is taught in Spanish and Basque is not studied; this statistic demonstrates that almost all parents consider it important that their child learn at least some Euskara. In fact, most families chose models B and D, regardless of the child’s mother tongue, and students in these models consistently outperform their counterparts in Model A (Amorrortu 5). This undeniable disparity (which can be observed through the four educational models, statistical evidence, and anecdotes from everyday life in Basque Country) between the reality of language usage and activists’ idealized world – a situation that can be described as diglossic, with Spanish as the “high” language and Basque as the “low” language – is considered unacceptable by some. Basque linguists generally view diglossia as a symptom of language decline, rather than a “stable form of bilingualism,” and make it clear that Basque will only survive if it can break into the private sphere of friends and family through a process called ‘normalization’ (Urla 387). However, regardless of what language individuals chose to use outside of the classroom, the fact remains that if education in Euskara is mandated, the language will not die. Regarding this topic, Jacqueline Urla asserts that, “…though Basques of differing political persuasions disagree as to how far planning should be taken…they regard the inevitability and necessity of language regulation of some sort as a matter of common sense” (Urla 380). Although alternative revival methods like media campaigns may help slow language decline to some extent, the fact that learning some degree of Euskara is mandatory means three positive things: 1) politicians, who represent the viewpoint of society in the democratic state, have passed education reform laws that reflect the consistent prioritization and valuation of Basque language, 2) as long as every child is obligated to speak some Basque, it may eventually become endangered (it isn’t yet) but will not die, and 3) while educators express concerns about students’ Basque proficiency, the language’s situation is improving with each year of acquisition planning: there are now more bilingual Euskara-Spanish speakers than ever before (Amorrortu 15). It is for the preceding reasons that I regard educative methods as the most powerful and empirically successful language planning tool available to Basque society. The initiation of consciousness-raising activities probably stemmed from the aforementioned secret ikastola schools, as both have grassroots characteristics. Unlike the mandated educative means outlined in the previous section, small Euskaran communities lack the organization of formal political and social structures, are spontaneous, and are geared to fit the needs of each community. In this mindset, resources such as free public lecture series are provided in town halls by Basque historians and linguists to promote and explain their work on the issue of speaking Euskara, which has come to be considered a serious “social welfare problem” (Urla 381). To address this problem, informal night schooling is available to adults and pro-language groups meet to discuss Basque culture. In both arenas, adults are encouraged to discover the connection between the Euskaran language and their Basque identity. Instructors even use syllogistic versions of the Sapir-Whorf hypothesis as part of the consciousness-raising project and to convey the cultural significance of Euskara (Urla 381). 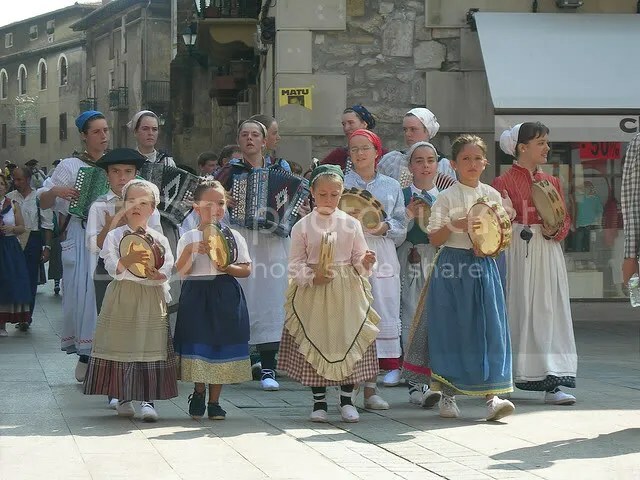 Similar to the insistence upon a Euskaran education for children, these communal methods seem to have had a profound effect on the mindset and cultural identity of Basque adults. Basques do recognize and sometimes even worry about the fact that their language choices will directly affect the survival of their language. To this end, media campaigns have been spurred to propagate the message that, “…the individual who does not speak Basque is seen to be contributing to its demise” (Urla 388). Thus, although consciousness-raising methods may seem to be so locally based that they are nearly ineffective, the free lecture series, town hall meetings, pro-language groups, and media campaigns have coalesced into a mounting social pressure that has an immeasurable but very real effect upon individuals’ linguistic code usage. The result in the Basque Autonomous Community is not only increased consciousness, but also a potent form of adult peer pressure – a strong social impetus indeed. Therefore, while the fate of minority language Euskara is not immediately certain, and although only about one third of Basque Country is completely fluent, the historical outcome is not entirely unpredictable either. That is, as long as Basque language remains a keystone of Basque identity, it will be preserved in the Basque Autonomous Region. As demonstrated, enough of the general population (not to mention the activists, nationalists, and mainstream politicians) cares deeply about the active promotion of their language and perceives Euskara as a source of cultural, national, and personal pride that it will not become endangered or extinct anytime soon. It is safe to conclude that because Euskara has survived through the Francoist regime, rapid industrial revolutions and waves of immigration, it is more stable and preserved than ever by today’s democratic Basque society. Only one question remains: since the proliferation of Basque education is by far the most powerful and successful language planning method available, to what extent will younger generations learn and protect Euskara? Will they continue their parents’ legacy of revitalization and preservation into the 21st century? Though Euskara has gained great ground in recent years, the answer is still unclear. However, for some Basque proponents, the future looks bright because, as explained by a Basque-schooled student, “A language isn’t lost because those who don’t know it don’t learn it, but because those who know it don’t speak it” (Echeverria 364). Fortunately, each year more children become fluent in Euskara than the year before, weakening the Spanish-Basque diglossia and slowly helping Euskara break into what linguists consider the perfect arena for language preservation: the private sphere. There are 3 million inhabitants, not 300 million. Euskara IS classified as endangered.